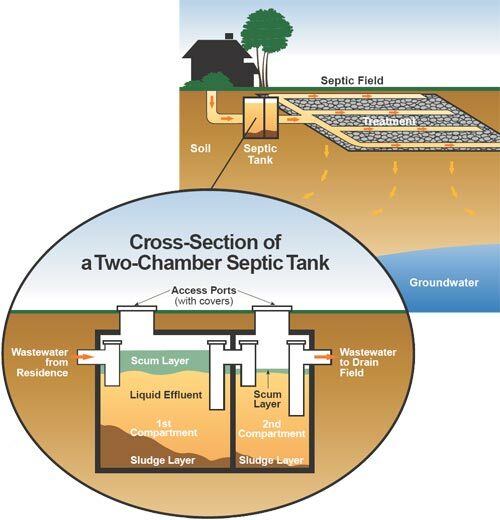 Septic systems are designed to safely recycle wastewater back into the natural environment. If you don't operate or maintain your septic system properly, it can be dangerous for your family, pose a threat to public health or the environment and affect neighbouring property owners. The waste separates into sludge, liquid and scum. Naturally occurring bacteria break down the sludge and the scum. Solids that can't be broken down settle at the bottom and must be pumped out regularly. The liquid flows out of the tank into a network of underground pipes that drain into the septic field. Naturally occurring 'good' bacteria in the soil feed on and break down harmful chemicals and bacteria, completing the treatment process. There are things you can do to extend the life of your septic system and to enhance its efficiency. How often should I pump out the septic tank? Pumping frequency depends on the size of the tank, the number of people living in the house, the amount of water used and the volume of solids in the wastewater. A licensed septic system professional can help you determine the pumping frequency. When is the best time to pump out the tank? Pump out the septic tank in summer or early fall. This leaves enough time before winter for the bacteria to start working again. How can I avoid putting too much water in the tank? don't run water continuously when shaving, brushing teeth or washing fruits/vegetables. What should I keep out of the septic system? How do I take care of my septic field? Plant grass on your septic field. Water sparingly. Do not plant large trees or shrubs, as their roots can clog the system. Keep rainwater runoff away from the septic field. Keep sump pump and foundation drains away from the system as well. Keep heavy vehicles and equipment off your field. Don't build over the septic field. Insulate your system against the cold. Let the grass grow longer to hold the snow or put down a layer (20-30 centimetres / 8-12 inches) of loose hay or straw. With proper care and maintenance, your septic tank and field should provide many (20 - 25) years of service. Considering the soil conditions in the Winnipeg area, septic fields can fail in 5 - 10 years if they aren't maintained properly. How can I tell when my septic system is failing? Never enter a septic tank. Use a licensed professional for any septic repairs or service. Deadly gases are present in a sewage holding tank. Use biodegradable or environmentally friendly cleaning products. Install an effluent filter in your septic tank to help prevent solids from clogging your septic field. Don't use a garburator; it can double the amount of solids in your tank. Keep a record of inspections, septic tank pump-outs and any repairs or service. Contact Manitoba Conservation at 204-945-7100 for more information.